All intergral products within the catalogue have a two year parts only warranty. Fabrication/Cosmetic items not notified as damaged at the time of installation/supply. Warranty becomes invalid if non approved parts are fitted. Use of the equipment other than for its design purpose will invalidate the warranty. All claims are to be submitted with complete service engineers documentation. Interlevin’s spares department supports cabinet sales by holding in depth spares stock covering 2,900 components. We operate a full and comprehensive computer support system which allows us to identify all models and their individual parts thereby ensuring an immediate response what ever your needs. All our spares are despatched via U.P.S for next day delivery and can be verified by a P.O.D. one hour after delivery has taken place. There is also an option of a before 10am delivery upon request, our staff are here to help and will do everything possible to ensure customer satisfaction. 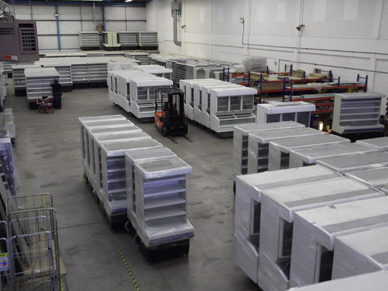 Interlevin’s refrigeration service labour warranty operates on a Monday to Friday basis (EXCLUDING BANK HOLIDAYS) between the hours of 08.30hrs and 1700hrs, where possible the initial call will be attended by one of our skilled engineers within 24 hours or less dependant on the area. This is supported by our ability to deliver all parts required to facilitate a full repair the very next day ensuring the down time of the cabinet is kept to a minimum. We operate a full and comprehensive service database, which covers the life of all cabinets, and their service history, Interlevin supports customers needs for technical assistance by way of technical support over the phone or literature information direct from the manufacturer.